The residency program for the College of Doctoral Studies at Grand Canyon University now resides on campus. The program recently moved from its former home at a nearby resort to start hosting doctoral learners at the Grand Canyon University Hotel and campus. 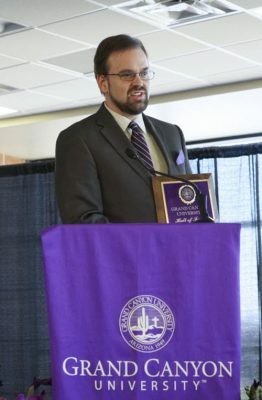 “The growth in classroom space and our new hotel makes it possible to hold many of our residency sessions at GCU,” said Dr. Michael Berger, dean of the College of Doctoral Studies. The move to the 152-room hotel and Phoenix campus has helped “energize and focus the learners. It’s great to be back on campus,” Berger said. Two other benefits of the on-campus residency: It allows learners to spend extra time in the library and saves about $200 a trip in hotel costs. GCU expects nearly 2,600 learners to attend the weeklong doctoral residency events this academic year. Doctoral learners are required to attend two residencies before completing their dissertation. The mandatory residency provides training and feedback for researching and helps greatly with the writing of dissertations.